Dubai — Landing at Nepal’s International Airport was the first stop for a group of trekkers from Dubai who were planning to ascend the Everest base camp. But the 7.8 magnitude earthquake jolted the group within half an hour of their landing in Nepal. A team of students and academics from Dubai’s Murdoch University and Global Institute Middle East (GIMEL) recollected the horror of finding their way back to Dubai after being stuck in Nepal for two days. Rakesh Wahi, Vice-Chairman and Co-Founder of GIMEL and Chris Pilgrim, Senior Vice-President, Business Development and Special Projects, GIMEL, led the team. The Everest Base Camp Trek crew consisted of four staff and three students — Hu Xiao, a Chinese student who studies Finance and Marketing; Maria D’Costa, an Indian student doing IT; and Ahmed Al Saidy, an Egyptian student doing Journalism at Murdoch University Dubai. 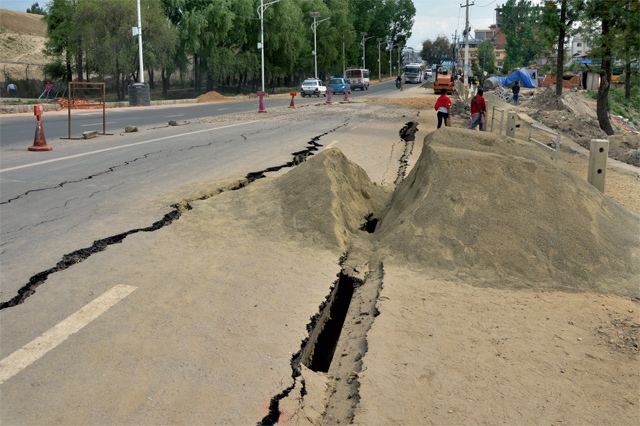 The first earthquake measuring 7.8 on the Richter scale hit within 30 minutes of the team’s landing in Kathmandu Airport on Saturday, April 25. The team immediately headed to the Tibet Guest House in two cars when the first earthquake hit. One of the drivers got a call that his family was in danger, and he immediately drove the car into a garage in a clustered village abandoning the team. Several hours later the team managed to regroup with the others at the hotel with the help of another driver. Once the gravity of the situation was understood, the entire team worked feverishly on finding a way out, establishing reliable communication, and more importantly ensuring the safety of the team. A strong line of communication was set up between the team and support group at the GIMEL in Dubai which was constantly keeping them posted of expected aftershocks, allowing them to be cautious and even help locals and tourists along the way. Although food and water had become a problem in Nepal, the team survived on its own rations originally packed for the trek. They also survived on local staples like Wai Wai Noodles and a mildly spiced lentil soup served with whole-wheat bread, rather daal-roti. The team on ground spent 48 gruelling hours working out exit strategies together with the team in Dubai. On day two, a unanimous decision was made to trek 20 kilometres on foot to the airport through wide open paths adjacent to a river stream since roads had been badly damaged and strong aftershocks were still being felt. “The team survived another quake measuring 6.7 during the 20-km trek and at this point we were just outside the presidential palace located midway to the airport. It was touching to see how communities came together, helping each other out. Everyone had moved outside their homes to open spaces,” said Chris. The trekkers slept in open spaces with the team resting outside the hotel reception on the first day. Their second night was spent outside the fortified Air Traffic Control Centre of the airport. Although the team never reached base camp they did in fact achieve their team building objective.